On the Christmas episode of We Hate Movies, the guys check out the ridiculous holiday classic? -- Santa Claus: The Movie! What's with the opening of the film featuring Santa and Mrs. Claus freezing to death? Where did these elves come up with this Santa idea in the first place? And why in the world are we waiting OVER AN HOUR to bring John Lithgow into the film? PLUS: Jesse "The Body" Ventura weighs in on the movie... and a lot more. 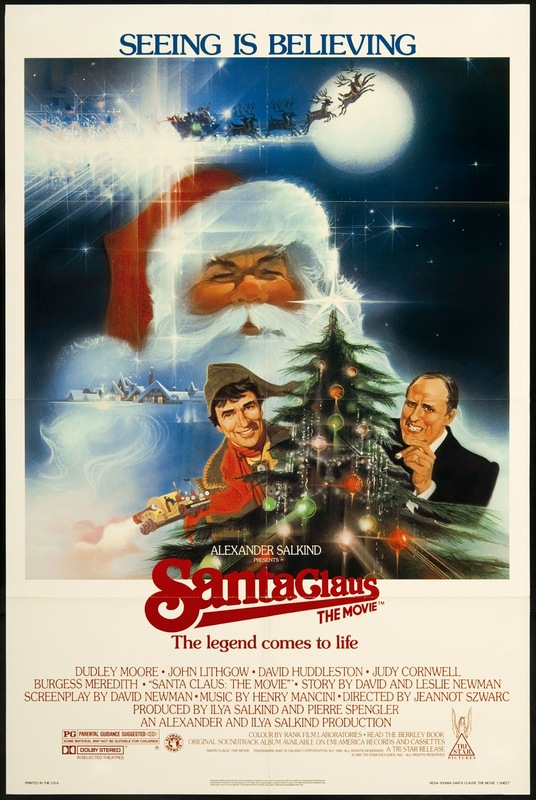 Santa Claus: The Movie stars Dudley Moore, John Lithgow, David Huddleston, and Burgess Meredith; directed by Jeannot Szwarc. Hey gang, support the show any way you can this holiday season! Here are some tips: tell your friends and family about the show, make a donation on our website, check out our merch store, pick up some commentaries, or purchase some limited edition show art! This might be the movie I have the earliest memory of ever seeing. My nursery school showed it for Christmas when I was 4 years old. It's a CRIME that WHM isn't a more well-known podcast after all these years. I blame it on the sheer glut of bad movie podcasts out there right now, where it seems anyone with a tape recorder and vocal chords have deemed themselves fit to try to entertain the masses. And that saturation vomits up some truly awful podcasts that somehow get lumped in as possessing the same caliber of sharpness and wit as WHM. I mean, have you listened to some of these? F This Movie features the exploits of a sole qualified, film literate podcaster and his outmatched, mentally disenfranchised friend who struggles to put together anything resembling a point and almost always ends up capitulating to his higher-functioning better on that show. Stinker Madness has way too many people chiming in at the same time, all with diminishing degrees of film literacy and none with even an inkling of a sound sense of humor. Worse yet, it sounds like it is recorded in the john. In the john! The Flophouse is near unlistenable in it's inanity. Film Sack is tedious, featuring a motley crew of pedantic and humorless bores. And We Hate Movies has devolved into a commercial-ridden, corporate shill of a podcast, where the cast spends more time trying to come up with quirky taglines for t-shirts to sell than they do actually having fun with any of these terrible movies. WHM has become death, the destroyer of other bad movie podcasts. You guys are king of all you survey in the world of awful movies. There is no podcast on the scene comparable to the caliber of humor, entertainment and insight you consistently bring to your audience. I dare anyone to listen to any one of your hundreds of episodes and say these brave few do not belong on the battlefield of bad movie podcasting. You are our elite warriors, your feet propped up in unmatched victory on top of the carcasses (carcassii?) of the myriad abysmal films you have slain over the long, hard years. And all we can offer in return is our fealty, and our appreciation and gratitude for your selfless service in the face of such scandalous mistreatment from the world at large. It is a black mark upon us all that some still refuse to recognize your rightful place on the throne of bad movie podcasting. Their shame in not doing so is all of our shames'. Please forgive us, and may your Christmas season be blessed and bountiful. Thank you. Ugh I meant How Did This Get Made when talking about that hour-long commercial of a podcast, not We Hate Movies obviously! A single Etsy page does not a gluttonous corporate whore make! There's room for the whole spectrum of movie podcasts but, all the same, I question the judgment of anyone who doesn't see that WHM is leaps and bounds ahead of the pack. This came out when I was a kid and I read the novelization before I ever saw the movie. Got the book from a school bookfair, I believe. I actually liked the book for some reason and convinced my family to see the movie. I'm lucky they're still speaking to me. I don't know why I liked the book, since it's the same story as the movie, maybe my imagination made it better somehow? The movie is completely wretched though. Really enjoyed this episode.